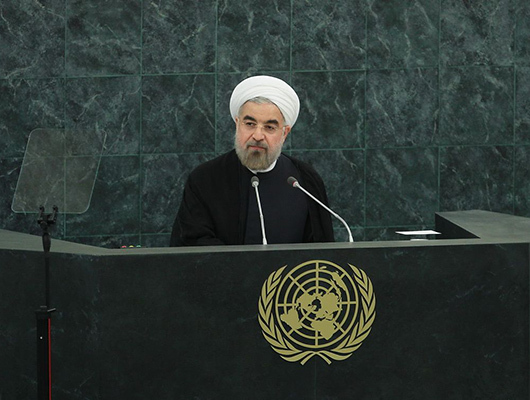 Iranian President Hassan Rouhani will visit New York City to attend the 71st United Nations General Assembly Session due to be held from September 20 to 26, Iran’s First Vice-President Eshagh Jahangiri announced. The session will kick off with a speech by UN Secretary General Ban Ki-moon and President of the 71st session, Peter Thomson. The US and French presidents, Barack Obama and Francois Hollande, as well as British Prime Minister Theresa May will also speak on the first day. According to the Kremlin Spokesman Dmitry Peskov, Russian President Vladimir Putin will not attend the session this year, Mehr reported. Jahangiri further maintained that President Rouhani will also visit Venezuela from September 13 to 18 prior to New York in order to attend the 17th Non-Aligned Movement Summit to hand over the rotating presidency of NAM to Venezuela for the next three years. “The President is also likely to visit another Latin American country,” he added. Earlier, Iran’s Transport Minister Abbas Akhoundi had noted that Rouhani will also pay an official visit to Germany in late September or early October.